Hubble has took these images of Saturn's north pole auroras in April and May of 2013. Saturn's northern lights dance in ethereal blue light in a series of amazing images captured by the Hubble Space Telescope. Bright flashes of auroras glow against the blue backdrop of Saturn's north pole in the new ultraviolet images released by the European Space Agency on May 19. The newly released images show bits of time when streams of particles shot out by the sun affected Saturn's magnetic field, ESA officials said in a statement. Hubble captured the pictures in April and May of 2013, and they may help scientists learn more about how the planet's auroras change. The photos reveal previously unnoticed details about the choreography of the northern light, ESA officials added. "Saturn has a long, comet-like magnetic tail known as a magnetotail — as do Mercury, Jupiter, Uranus, Neptune and Earth," NASA officials said of the observations in a statement. "This magnetotail is present around planets that have a magnetic field, caused by a rotating core of magnetic elements. It appears that when bursts of particles from the sun hit Saturn, the planet’s magnetotail collapses and later reconfigures itself, an event that is reflected in the dynamics of its aurorae [auroras]." 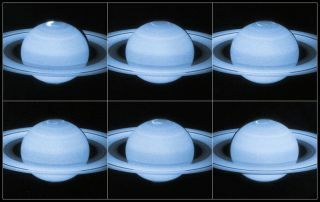 The Hubble photos are part of a three-year observing campaign with Hubble and Cassini. The two spacecraft have also captured a 360-degree view of Saturn's north pole and south pole auroras, NASA officials said. Cassini has been in orbit around Saturn since 2004 and is now on an extended mission that will last until at least 2017. The Hubble Space Telescope — run by ESA and NASA — launched to space in 1990. Unlike Cassini, the space telescope makes its observations from an orbit near Earth. Scientists hope that Hubble will continue to make observations until about 2020.